Gregory Aponte, Juliana McMillan-Wilhoit, and Jessie Petit of Task Force Power Restoration Geographical Information Systems Team display a map and graphic illustrating 72 percent of electric meters on the island were energized. Photo: Robert DeDeaux USACE Public Affairs. Gregory Aponte, a civil engineer with the New York District, U.S. Army Corps of Engineers (USACE), surprised his parents by showing up unannounced at their home in Puerto Rico. He had to because he had no way of contacting them. They lost power from Hurricane Maria. “After the storm made landfall, I didn’t hear from them for three days. I started getting a little uneasy,” said Aponte. Aponte went there to ensure his parents were all right. He was also there to make life better for millions of citizens of the American commonwealth dealing with the aftermath of the strongest hurricane to hit the island in almost a century. Aponte was one of approximately 2,000 Army Corps and contractor personnel who deployed to Puerto Rico for the Army Corps’ Task Force Power Restoration Mission. The mission was to make repairs to the damaged power system in order for it to generate electrical power temporarily. Aponte’s role was to use GIS and map out the island’s electrical power grid in order to make repairs. The Army Corps was called upon for its GIS expertise many times before, including FEMA’s wildfire mission in California and for Hurricane Sandy. Last September, Hurricane Maria made landfall. The Category 4 hurricane was on the heels of Hurricane Irma that made landfall just 12 days prior. In just hours, 155-mph winds and torrential rain caused widespread destruction, resulting in $90 billion in damages. What was also devastated was the island’s aging and fragile, 80-year-old power system. The vicious winds toppled transmission towers, snapped concrete utility poles, entangled lines, and battered power plants — creating the largest power outage in American history. The lack of power for weeks in some places impacted every aspect of the economy and livelihood. There were closed factories, hospitals, banks, food stores, as well as water treatment plants that resulted in poor quality water. “My parents didn’t have power and water for three months,” said Aponte. After the hurricane’s onset, The Federal Emergency Management Agency (FEMA) began a Puerto Rico Recovery Mission that included repairing the power system. The Army Corps was called upon for assistance and worked under the direction of FEMA, as well as in partnership with the Government of Puerto Rico, Puerto Rico Electric Power Authority — the island’s state-run power company — and the U.S. Department of Energy. To restore power, the Army Corps provided temporary emergency power and spot generation for critical facilities such as hospitals and water treatment plants; ensured adequate generation at power plants; reinstalled and repaired transmission lines; and restored and repaired distribution lines. The Army Corps installed more generators for this mission than after Hurricanes Sandy, Rita, and Katrina combined. GIS was used to perform this work in an efficient manner. According to Aponte, the beginning of the mission was chaotic because different organizations had their own information that had different levels of accuracy. Aponte, who served as a GIS specialist team leader, created a system that synchronized and updated information in one place. His team created the Task Force Power Restoration web viewer, an internal interactive database of information created using Esri’s ArcGIS Online platform, which allows organizations to create, manage, share, and analyze spatial data. The viewer kept involved participants updated on the mission progress and helped leaders make critical decisions. The system is an electronic map of the entire island of Puerto Rico, including a few smaller islands that are part of the region, totaling 5,320 square miles. Inside the map of the island, the power system and various components that intersect the region are displayed in different colors. Components include transmission and sub-transmission lines, temporary power locations, transmission centers, micro grids, and substations. As repairs were being made to these components, the viewer kept track of the percentage of the work getting completed. Energized regions were indicated in green on the system. The viewer also has a sub-viewer within it called the Environmental Compliance Viewer. This system kept track of environmental impacts that needed mitigating. To begin building the viewer, several layers of pre-existing data were collected from the Government of Puerto Rico and FEMA and used to create a foundation. This data included demographic information; geographic data such as terrain, wetland, fish, and wildlife areas of concern; pre- and post-storm imagery; the location of critical public facilities; and municipal and political boundaries. The team was also furnished data on the power system including the location of transmission centers, substations, micro grids, and transmission lines and the number of homes that received power from them. “Knowing where the transmission lines were located and the number of homes they served was important because it told us how many people were getting energized when we repaired a power line,” Aponte said. Aponte said that these transmission lines zig zag all over the island, in and around mountains, streams, and other topographic features. In order to make the lines easy for the team to identify on the viewer, they displayed them as straight lines on the schematic. With a foundation in place, Aponte and his team started populating the system daily with information they received from field offices located throughout the island. 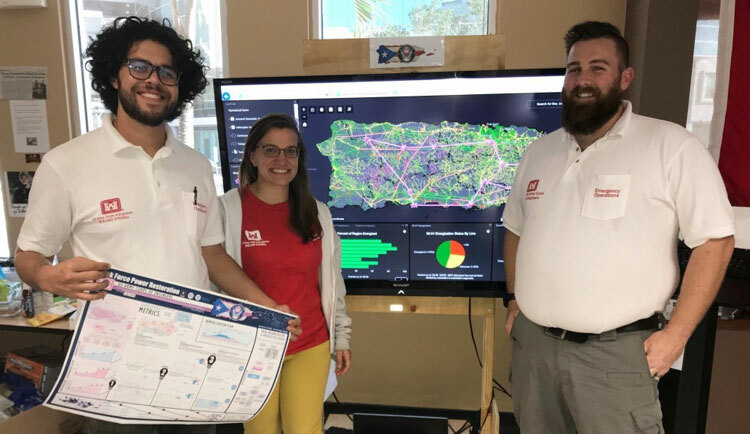 “At our headquarters’ office we had a big screen displaying the viewer and we updated it with information from our field officers,” said Aponte. The field offices had an Army Corps GIS specialist who provided Aponte information from contractors and various agencies pertaining to their specific regions. This information included the number of utility poles, the location of access roads, damage reports and assessments, power system repairs, contractor locations and work they were performing, location of building supplies, environmental impacts, and regions getting energized. “Contractors at the field locations used aerial drones to survey areas and locate transmission lines among fallen trees. They used GPS to validate these lines,” said Aponte. The team also used the viewer to perform spatial analysis for Army Corps and FEMA leadership. They created products — such as map books, infographs and models — to keep them updated on the mission and to help them make important decisions that saved the mission time and resources. These decisions included whether to deviate a power line that is being repaired that is obstructed by fallen trees or a landslide and which access cut paths are the safest and most efficient to travel on to reach transmission lines that need repairing, among many other decisions. Aponte is particularly proud of a time they used the viewer information to make the best use of mission resources. “We were approaching the end of the mission and were assessing our time and funds and we saw there was remaining money,” Aponte said. “We asked ourselves several questions: What can we do that would do the most good? Make the best use of our remaining resources? Contractor’s time? Make the most impact? Energize the most residents? We wanted to see where there was the most need of power restoration and the most number of people. The power mission was completed and as of August 2018, 99 percent of the island’s power had been restored. Even though the mission is completed, the viewer is still of great value. “Right now, FEMA is using the web viewer data to look at ways to modernize the island’s crippling power system,” said Aponte. It’s been a year since Maria struck the island and we are in a new hurricane season. Can Puerto Rico handle it? “If another hurricane were to hit, the Army Corps’ work has made the system stronger than it was before Maria,” said Aponte. Deploying to Puerto Rico was bittersweet for Aponte. He deployed there a few times, first to help with housing and most recently to help the power mission. Each time, he saw Puerto Ricans go through hard times and in Spanish he explained to them the work the Army Corps was performing and how it will help them.